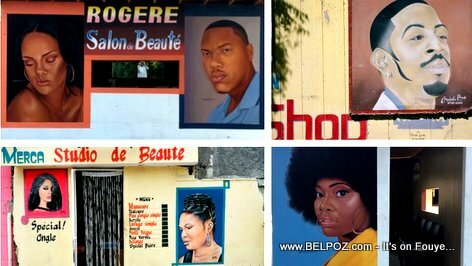 There is an article on Voque Magazine's web site featuring the artworks and unique portraits of stars like Rihanna and Ludacris hand-painted on Haitian barbershops across Haiti and the New Brooklyn Exhibition showcasing more than 25 Haitian artists behind these amazing paintings. Art is everywhere in Haiti, we see it everyday on walls, on buses, on tap-taps, and yes in front of every little Haitian barbershop 'gerit' across the country but did you ever think these artworks, something no more important to a Haitian than a street sign, would be ever make it to a New York art exhibition, let alone be a topic of interest in the beauty section of Vogue magazine? The exhibition is called "Pòtoprens: The Urban Artists of Port-au-Prince," it brings together the work of over 25 artists working in the Haitian capital. The exhibition, on view September 7 to November 11, 2018, highlights Port-au-Prince's many diverse centers of cultural production, informal street life, religious heritage, and mythologies to create a compelling portrait of a historically significant and intensely complex city in flux. Sadly, the Haitian artists highlighted in the exhibition were denied a visa to go to the United States to see their work on display.